It's time for another giveaway here on iSource! This time, thanks goes to gearzap.com. They're providing four different iPad accessories to one lucky winner. This case is similar to Apple’s official offering. It’s made of high-quality leather and includes a snap-close feature to keep your iPad scratch-free. All ports are accessible while in the case, which fits the current and previous two iPad generations. Also included is a notepad, located on the inside flap, which allows for easy note taking while browsing. And, of course, the case folds into a stand for easy photo and movie viewing. By now, most blog readers are familiar with the InvisibleSHIELD product line. They are one of the most trusted names in electronic device protection. They use grade-A materials for their shields, a transparent layer of protection for your iPad. It’s easy to apply, but makes a world of difference in keeping your iPad scratch-free. Do you love your iPad, but prefer your PC to type long e-mails? Then this is the stand for you. Rest your iPad in this stand, connect via bluetooth, and voila. You’re good to go. 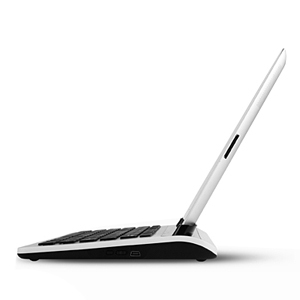 The stand will hold your iPad in both viewing angles and features a keyboard that’s fully compatible with your iPad. The iPad can do a lot, but one thing it struggles with is drawing. That’s where the stylus comes in. The Adonit Jot Pro features a disc at the tip, which allows for neater handwriting and sharper drawings. The pen features a combination of metal and a soft rubber grip, allowing for durability and comfort. Includes a protective cap for the disc tip. Just add ONE comment to this post, making sure to fill out the ‘email address‘ field (don‘t worry, it won’t be displayed and we won‘t use it for any other reason than to contact you if you win) and you‘re in with ONE entry to win this iPad prize pack. This contest is open to residents worldwide. We’ll draw our winner on Wednesday (9/18/13) sometime after 8:00pm US Eastern time. Good luck! Please note: only accessories are included in this giveaway. iPad sold separately. This would be a blessing to win this!! I got all these things for my other devices, but not for my iPad 2 (except a cover). Yes, Thank you, I’ll take one. Very cool stuff. I could absolutely use this for work! This is hot!!! Pick me please!!! I like that keyboard stand! I can’t wait to win one of these prizes. The giveaway includes some really nice items. The keyboard stand is really nice! sounds awesome,would love to win! This would be a great asset to my wife for school. She teaches 8th grade ELA, and needs more technology in her classroom. She currently has one computer, that is not much help, and very old. Give away time 😀 😀 :D!!! awesome! I would love to win this! I do not have enough accessories for my iPad. How marvelous would that be! Cool prizes, I’m especially interested in the case. Mine needs better protection. Awesome stuff! Thanks to iSource and Gearzap. Sweet prizes! I am especially interested in the Adoint Jot Pro! I appreciate you guys hosting things like this. Happy iOS 7 Release Day! This would be so great. My husband’s computer is a dinosaur, and HE NEEDS HELP!!! Nice prize package that covers it all.